Pink & Green Diaper Cake - see how Kari made one! Kari shares her creativity with a pink, purple and green diaper cake! Look at her diaper cake picture below and read her comments on what ideas she used to make her special baby blanket diaper cake. She even personalized it with the name of the baby. Kari has shared her creativity and ideas to inspire others to venture out on their own and create something special. That is the beauty of this website, a forum to share ideas and get-and-give inspiration. And it's all thanks to readers like Kari - so from all our readers: thanks for sharing your cute ideas Kari! I used a bottle brush in the middle to support the 2 bottom tiers. I used 92 Pampers Swaddlers Size 1 diapers, rolled and rubber-banded. I wrapped the 2nd & 4th tiers with baby blankets - secured with a ribbon. I added the baby's name (Micah) to the blanket with scrapbooking letter stickers. 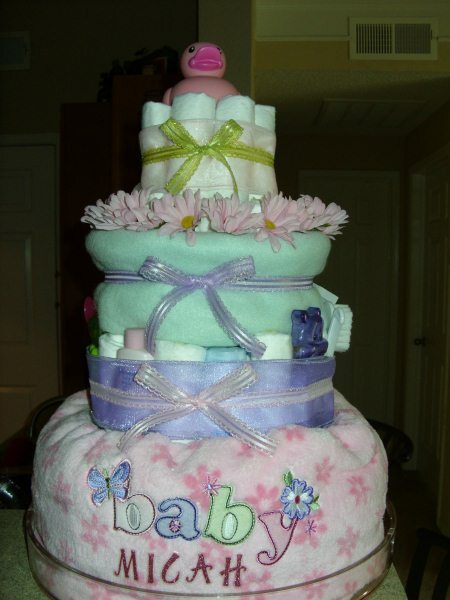 Thank you again for sharing your cute diaper cake Kari! !